Nuisance calls come in many forms and for this reason it is important to learn how to deal with unwanted calls so each member of your family is protected. Cold calls can result in scams and spending money you don’t have on services you don’t need. Here’s how every member of the family can avoid nuisance call stress and financial danger. According to Citizens Advice, nearly 32 million people received communication from companies trying to sell PPI. A huge 98 percent of these people said they didn’t ask for, and didn’t want the calls in the first place. You and your partner are likely to have to handle calls from financial agents, insurances salespeople, double glazing sellers, and other un-asked for information during meals, at work, or at other inopportune times. In fact, the Citizens Advice survey showed that 27 percent of people received a call about PPI during family meal times, and 14 percent were called at work. 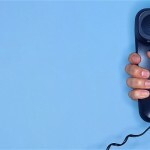 Citizens Advice says you should hang up on direct marketing calls, whenever they take place. Ignore text messages. Report financial scams or other types of scams to Action Fraud. Attempt to block unwanted sales calls by contacting the Telephone Preference Service and registering your number along with your need to stop receiving calls from the offending numbers. Remind your relatives that when a person calls out of the blue offering a service that seems too good to be true, it is usually too good to be true. Unwanted sales calls ring alarms bells about the quality of the service – the products are usually substandard and you could end up wasting money. Educate your elderly relatives about the problems with cold calls and tell them to simply hang up when they receive them – ask them not to engage in conversation with the person on the other end of the line. If your children have mobile phones it is important to educate them about dealing with spam calls and nuisance calls. Remind them never to talk to strangers on the phone or reply to text messages from unknown people. If your children receive texts or calls from unknown numbers tell them to report them to you, so you can block the numbers or follow-up with the authorities. Make it clear that children should never give out family details over the phone. When thinking about blocking phone numbers it is useful to be able to stop unwanted calls before you have to deal with them. This is particularly important when you have children or elderly relatives – preventing the calls from getting through in the first place removes the danger of kids and seniors acting on spam messages or signing you up for unwanted services. Install a nuisance call blocker on your home telephone that prevents sales, spam, silent, and marketing calls from getting through. The more calls you can block at the source, the less stress you’ll experience and the fewer dangers your family will be exposed to.